Food Services Department in Young’s Provides Value based Solutions to the Out of Home Market; with Best in Class Quality, Technical Support and Optimum Costs. 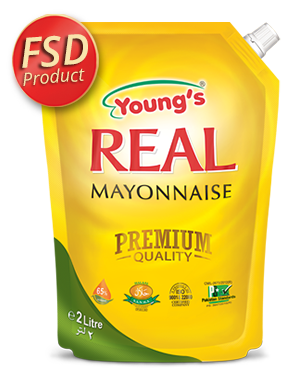 Young’s “Real Mayonnaise” is a premium mayonnaise which gives best flavor to zinger burgers, sandwiches rolls and dip sauces. Its rich texture, and unique European taste creates the most appealing mouth feel, and increases the value of the food it is used with. Young’s Real Mayonnaise is ideal for all Premium food products and especially for Hot Applications. Ultra Heat Resistant: Young’s Real Mayonnaise is UHR (Ultra Heat Resistant). It is twice as heat resistant as compared to any other Real Mayonnaise. (Kindly ask any of our people for a live demonstration in your kitchen, with a hot pan). Vegetable oil, water, eggs, sugar, natural vinegar, salt mustard paste, modified food starch, xanthan gum, potassium sorbate, citric acid, calcium disodium ethylene Diamine tetra acetate (EDTA) and Natural food color. Young’s mayo dressing is an ideal economical solution, for healthy, hygienic and delicious food applications. 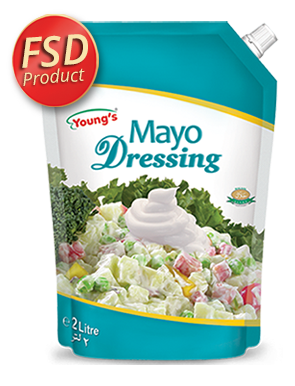 Young’s mayo dressing delights your fresh salad and brings the best flavor into. 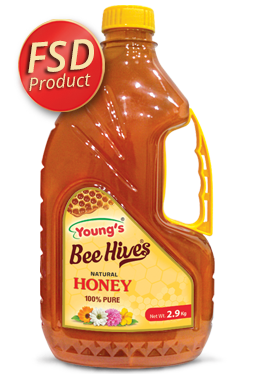 Young’s dressing is ideal for salads and could be used in sandwich and burgers; it adds value to your menu, with adding least to your budget. Vegetable oil, eggs, modified food starch, water, salt, sugar, Acetic Acid, Citric Acid, Calcium disodium, Ethlene diamine tetra acetate (EDTA), permitted food color & preservative. 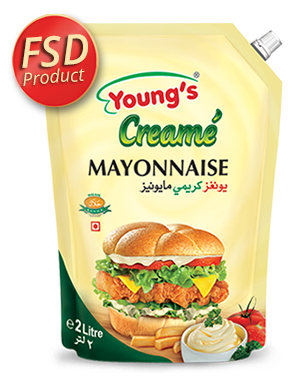 Young’s creamy mayonnaise has a rich creamy texture, with a mild saltish, mustard taste. The mild taste of young’s creamy mayonnaise is designed to allow this product to be used with other ingredients such as garlic, cheese, black pepper etc., to make specialized dip sauces and roll / shawarma fillings. Similarly the combination of mild lifting flavor with creamy texture allows this product to enhance the teste of fillings (chicken. beef) inside a sandwich. Vegetable oil, Eggs, Modified food starch, water, salt, sugar, Acetic Acid, Citric Acid, Xanthan Gum, Calcium Disodium Ethylene Diamine Tetra Acetate (EDTA), Permitted Food Color, Flavors & Preserves. 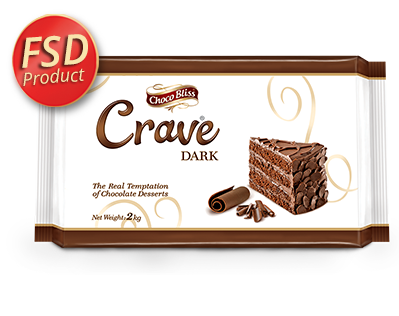 ChocoBliss Crave, a Dark touch of real temptation of chocolate desserts from the platform of Young’s (PVT) Ltd. It is an ideal solution for providing economy and quality at the same time for making delicious chocolate desserts. Major market segments include bakeries, hotels, restaurants and cafes. ChocoBliss Crave dark is used in making cakes, brownies, cookies, and chocolate desserts. Sugar, Vegetable fat, Cocoa powder, Milk solids, Emulsifiers (E322, E442, E476), Salt, Flavoring (Vanillin). It is an ideal solution for providing economy and quality at the same time for making delicious chocolate desserts. Major market segments include bakeries, hotels, restaurants and cafes. 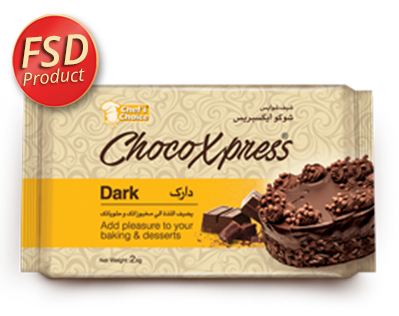 ChocoXpress is used in making cakes, brownies, cookies, and chocolate desserts.